Oh, the turmoil of packing the perfect carry-on. Packing gets me all in a tizzy. I loathe it so much, I procrastinate to the last minute doing things like work + laundry. Ask my husband at 1 a.m. as I contemplated every item I placed in my suitcase and carry-on as he tried to sleep. You don't want it to be too heavy so you don't have to burden your loving husband with carrying it around the airport, but you know it'll be the end of the world if you don't have your favorite trail mix...or chocolate...or camera...or chapstick...or enough airplane entertainment! After many flights and road trips, I'd like to think I've become a pro at packing my carry on, from finding the perfect tote, to the perfect scarf to snuggle in, to the essentials you wouldn't be caught without (face wipes, toothbrush, makeup), to my entertainment package (iPad, kinfolk magazine, iPhone, journal + pens) and of course, my babies (cameras + film). The perfect carry-on definitely makes for a more enjoyable flight. 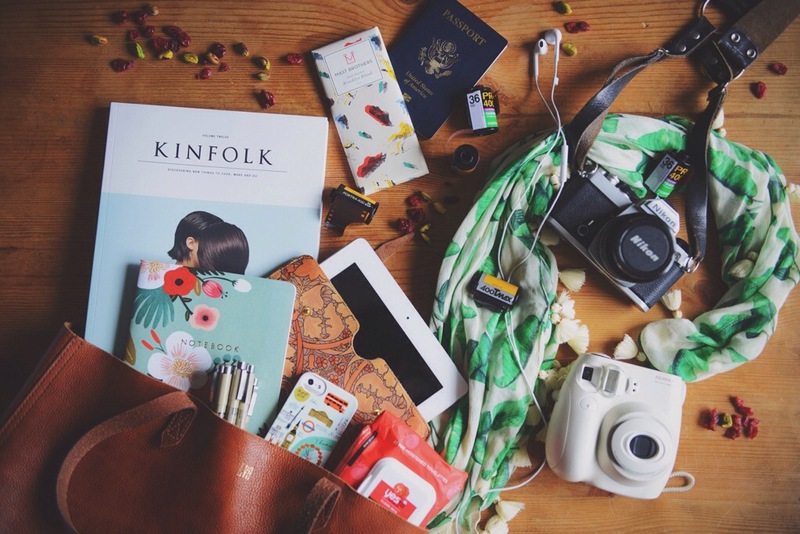 What's in your perfect carry-on bag?